Online electrical retailer reichelt elektronik has found with new research, that uses for smart technology in the workplace are misunderstood or not valued, with over 50% saying they will not be investing in the next 12 months. Smart technology has now become mainstream in our homes but it is yet to make the transition to the workplace. 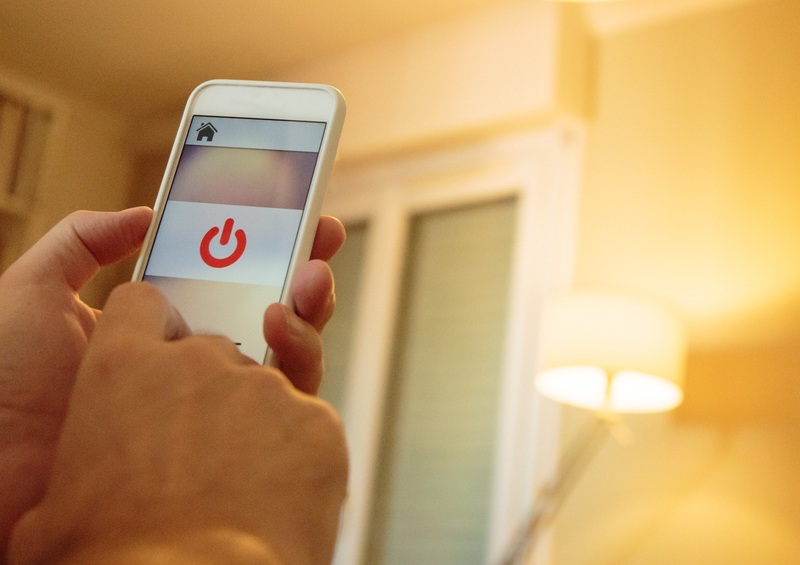 Research of businesses across the UK found that 21% are currently using smart technology, with the most common uses being; smart lighting (68%), smart alarm systems (47%) and smart heating/air conditioning (44%). 32% of employees believe the investment has been worthwhile, showing there are clear benefits and business advantages to implementing these systems. The research highlighted a clear technological gap between the UK and France and Germany, with our European neighbours embracing the capabilities of smart solutions in their offices – even automated blinds. 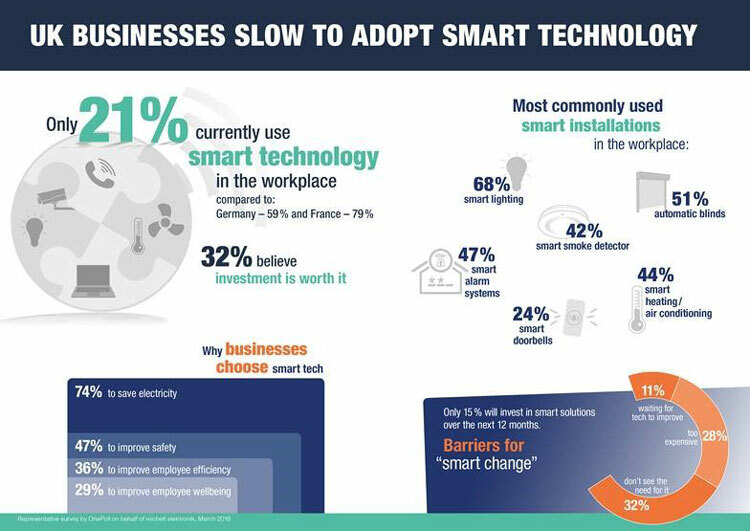 In Germany, as many as 59% said their workplace has smart tech, whereas in France it’s even higher at 79%, with 87% believing it has been worthwhile for their business. Furthermore, 69% are going to invest in more technology in the next 12 months in France and 58% of the respondents Germany say that their company has earmarked the purchase of a smart installation. This is compared to just 15% in the UK where the benefits are clearly not being realised. The biggest reason cited is simply because businesses don’t see the need for it (32%), while some think it’s too expensive (28%). Others are waiting for the technology to improve (11%). However, millennials think it is worthwhile to invest in technology for the future of the workplace. Smart Office Assistant – gimmick or real business advantage? A staggering half of participants don’t believe there is a place for voice-controlled assistants in the workplace, despite the popularity and increasing use of such devices at home. However, this contrasts the 66% of respondents in Germany and 66% in France that say they can imagine using voice-controlled smart assistants. Younger generations appear to be more open to the idea though in the UK, as 27% think they could be used successfully in the office. 72% of participants said their company didn’t currently use any form of smart tech, but these businesses that are yet to upgrade their systems are missing out on the efficiency and cost saving benefits. Of the companies that do use smart tech, 74% chose to do so to save electricity, ultimately reducing costs in the long term. A secondary reason for installing smart solutions was to improve safety for employees. Having sufficient lighting for employees to be able to safely carry out their work is incredibly important, as well as providing a secure environment. This is where smart lighting that can be automatically controlled and tailored to improve wellbeing and smart security systems add value. Where fine margins are crucial to making cost savings, if British businesses wait too long or end up failing to adapt and integrate systems into their organisations, they risk not achieving the cost saving benefits of improved safety, making it harder to adapt in the future and potentially losing out to more agile European cousins.